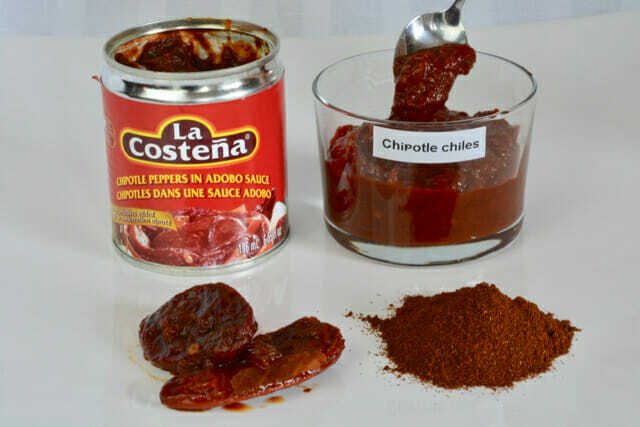 Chipotle chiles in adobo sauce vs chipotle powder from the spice aisle, which do you prefer? I have both but I use the chipotle chiles in adobo sauce more often. It seems to me that chipotle mayonnaise is the recipe that really took these chiles mainstream. They are smoky little chile peppers in a vinegar-based tomato sauce called adobo. The perfect balance of smokiness and acidity is almost addictive. As an everyday cook you only need to know enough about chiles to cook the recipes you like. Over time you learn more but a good guide to remember about chile peppers is the smaller the hotter. Jalapenos are not too small, are pretty well known and recognizable in the produce section. Chipotle chiles are smoked jalapeno chile peppers. Did you know the ‘t’ in chipotle is silent? I didn’t. For years I read that word in cookbooks and hunted for those chiles in specialty food shops and pronounced the ‘t’. Fortunately one does not need to know how to pronounce a food word to cook with it. They are sold in small tins containing six to eight chile peppers in sauce so there is an ingredient list. Many brands are gluten free but I have seen a label that listed wheat as an ingredient. At one time I did a thorough investigation and learned that La Costena brand is gluten free. Products change and vary by country so always read the label. Recipes sometimes call for just one chipotles, one chile with sauce and some recipes even call for adobo sauce only. After using chipotle chiles and messing around with many ways to store them I realized they are always going to get pureed. My method of dealing with them now is to puree the whole can as soon as I open it. The amount is slightly less than one cup so I put it into a one-cup Mason jar and label it. With good cross contamination practices (always use a clean spoon) the chiles will keep in the fridge for months. One chipotle chile is equivalent to approximately 1½ or 2 teaspoons. Depending on how much heat you like you can adjust this to your own taste. If you want to remind yourself how to use the puree then label the measurement right to the jar. I sometimes get teased about my use of a label maker but I love it. When I first starting learning about gluten free I added a second label to several things to help me learn. I think a label maker is an excellent purchase to stay organized and keep learning in your kitchen. This specialty item can be found in Mexican and Latin American specialty shops but can sometimes be found with other Mexican ingredients in well-stocked grocery stores. Of course you can order them on Amazon too. Chipotle chiles are also sold dried, either whole or ground. You can find them in bottles is the spice aisle at many grocery stores. The bottle should contain pure ground chipotle chiles so would be naturally gluten free. Chiles are a big topic and can be confusing with so many different types. For this post the message is that chili powder, the kind you might use to make a pot of chili, is not the same as chipotle chile powder. Growing up we ate a lot of chili. For us this was a one-pot meal of meat and beans. My grandmother called it chili con carne meaning chili with meat. In this case the word chili refers to both the spice and the dish itself. This type of chili powder is often a combination of different spices and I do not know what type of chile it might contain. Regardless, it is neither hot nor smoky but it is right there in the spice aisle. Know what you are looking for before you go shopping. I have never bought the whole dried chiles but I do have ground chipotle powder in my spice cupboard. It can be used like any dry spice. Add it to a dry rub or in a marinade, anywhere you want to add the unique taste of chipotle chile peppers. I can’t not mention the mayo. The now mainstream (dare I say fake) chipotle mayo that has become a popular condiment served in little packages with sweet potato fries. Let me say there is nothing like homemade. If you like mayonnaise then you absolutely must make your own chipotle mayo, at least once. There is no comparison to the food-like product that I have tasted at fast food outlets. Real mayonnaise is the result of a magic process combining egg yolks with oil. It is simple to make using a hand blender or food processor. The result is a silky smooth condiment that is delicious on its’ own but can be flavoured with roasted garlic, chipotle chile peppers or just about anything. My chipotle mayo recipe uses chipotle chiles in adobo sauce. We put it into a squeeze bottle and squirt it on anything from tacos to pizza. Here are some of my favourite recipes, aside from the Homemade Chipotle Mayo that use chipotle in both of these forms. This Corn with Feta and Lime starts by slathering a spicy mayo on the hot cobs of corn. Substitute chipotle powder in this recipe to add both heat and smoke. Be sure to include the feta and lime for the best corn dish you will make this summer! My basic cornbread recipe is excellent with the addition of grated cheddar cheese and a teaspoon of pureed chipotle chiles in adobo sauce. Serve it with a bowl of chili. How do you use chipotle chiles? Did you try something different? Let me know in the comments below.